Moroso makes a purpose-built catch-can, but I don't like it because (a) it's plastic, and (b) it has a vent filter built into the top. I want a metal container, so that I know it will stand up to the heat, and so that the sides can stay (relatively) cool, hoping that some of that oil vapour will condense in the can. I decided to make my own. The only metal container I could find that has a neck big enough for me to get my hand into is a paint can! Lansing sells empty 1-quart (small) paint cans for just two bucks. It even has a nice polished finish out the outside, and no label -- perfect! Finding bolt-on hose fittings was a real challenge. There are plenty of hose fittings in the air-tools sections of hardware stores, but none of them are big enough (the hose on the PCV valve is 5/8" ID), and they're all meant for joining hoses and air tools; none will bolt to the side of a container (fittings on air tanks are welded on). After spending some time loitering in the plumbing isles, I came up with something that should do the trick (thanks to Rick at the Kennedy/401 Lansing for suggestions). I found both PVC (poly vinyl chloride a.k.a. plastic, not to be confused with PCV!) 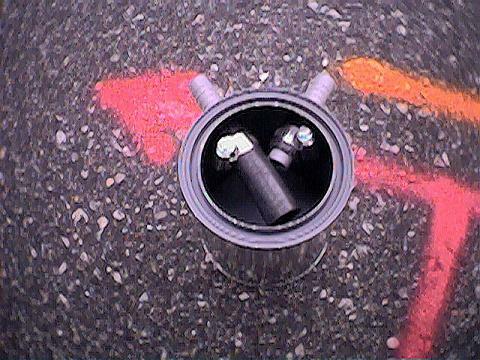 and metal pipe couplings. Although metal would stand up better to the heat and oil, I chose to use the PVC couplings this time, because they have a lip on them around the middle, which will keep them from moving too much. If they become brittle, I'll replace them with the metal ones. Decide where the two hose fittings should be on the can. I thought about putting them both through the lid, but I looked at where I would be installing the can (see below) and decided to put the fittings through the side of the can, for clearance purposes. I don't want the hoses to kink anywhere, there isn't really enough pressure in the PCV circuit to keep things flowing through a kinked hose. Cut a short piece of your 5/8" rubber hose, about 1/2" long. Hold this hose bit against the can where you want to mount one of the fittings. With the permanent marker, trace the inside diameter of the hose onto the can. Repeat for the second fitting. Hint: Look at the length of the fittings and how far they're going to project into the can. Place them accordingly so they won't interfere with each other. You now have two circles drawn on the side of the can. Put on safety glasses and leather gloves. Drill a hole in the middle of each circle. Your hole will be smaller than the circle. 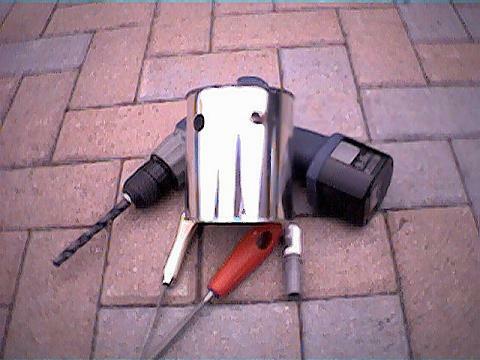 With the rasp, clean up the edges of the holes, and continue to widen each until the hose couplings juuust fit through. Cut a 1" piece of hose, and a longer piece of hose (about 3", look at the inside diameter of the can and eye-ball it, you want it a little less than the can diameter). Push one hose coupling through its hole and halfway into the can. Slip the 3" piece of hose onto the coupling inside the can. Push them together until the hose is tight up against the inside of the can, holding the coupling rigidly in place. Slip a little hose clamp onto the hose and tighten it. Do the same now for the other coupling and the 1" piece of hose, and another clamp. Okay, that's your test-fit. If you like the way everything fits together, then take it apart and do it again, this time squeezing a generous bead of Gloozit around the couplings where they meet the can. According to the label (and, to Rick), this stuff will stick to anything, and will remain pliable when cured so that it won't crack loose with movement or heat expansion. We'll see. A leak wouldn't be tragic, but it would be messy. The reason for one long hose and one short, is to separate the ends of the two bits of pipe. I don't want gases to go straight in one pipe and out the other, I want them to swirl around the can a bit first, hoping that some of the oil vapour will condense inside. 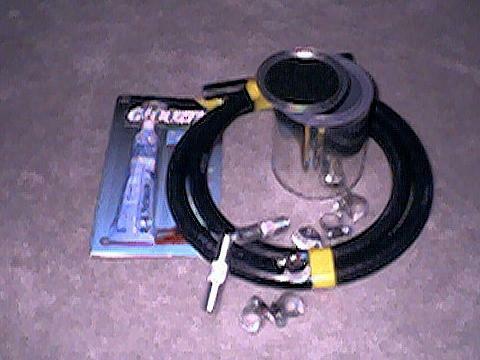 I will use the fitting with the long hose inside as the inlet fitting. The liquid oil will stay in the can in any case, as long as the level of oil in the can doesn't get as high as the output fitting! So that's the can complete. Finally, ring the lid with Teflon tape and hammer it on tight. 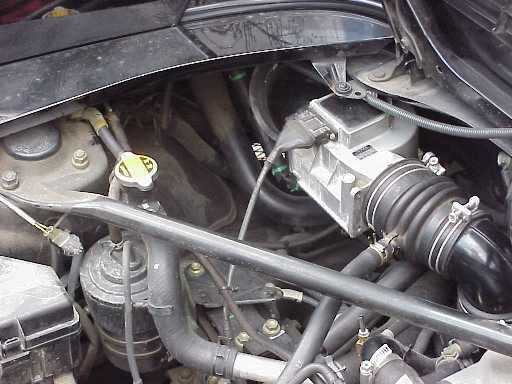 There are a few different places where one can mount a catch-can in an MR2 Turbo. I have removed my stock intake and replaced it with a cold-air pipe and K&N cone, so that opens up a couple of good options for me. I couls strap it against the gas-tank filler pipe with two big hose-clamps. 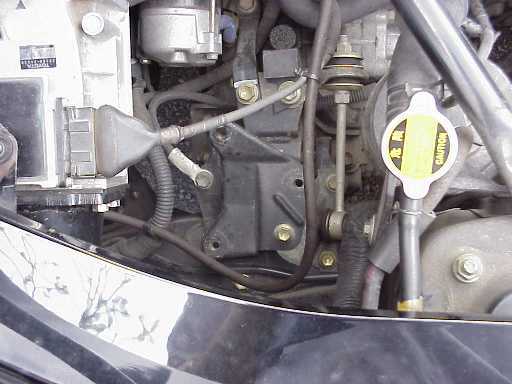 That would put the can at a 45-degree angle, pointing into the body, making it hard to check the accumulated oil level. Where the air intake used to bolt down, there is a level mounting plate with three or four bolt-holes in it. The space above it is empty. I can rig a way to mount the can flat here, making it easy to open the can to check the level. 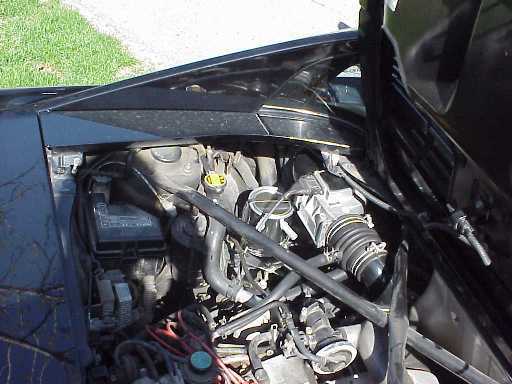 This is the driver's side of the engine compartment; the front of the car is to the left. In the centre of the pic you can see the intake mounting plate which is now available to hold the catch-can. This is the driver's side of the engine compartment; the front of the car is to the top-right. Low in the centre of the picture is the mounting plate again. 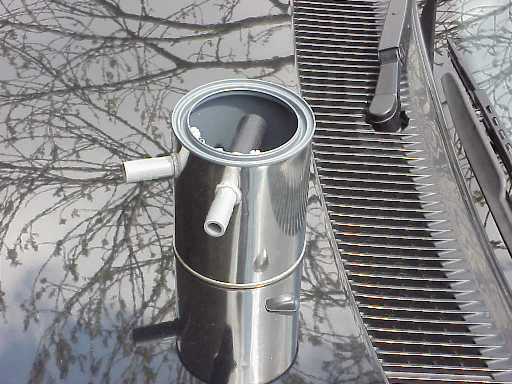 Above and behind it is the gasoline filler pipe, to which I could have strapped the catch-can. 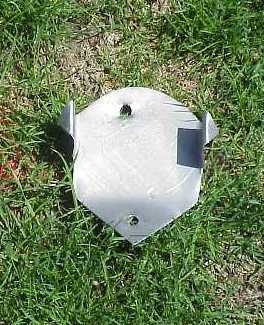 When constructing the can, think about where and how you will mount your catch-can before deciding where to drill the holes for the hose fittings. I could have put one or both hose fittings into the cap of the paint can. From the level mounting plate mentioned above, there is enough clearance for the hoses to arch over to the horizontal, and run to the PCV pipe and the intake pipe, where they attach. I could zip-tie them to the strut bar. But I foresaw the hoses kinking at the catch-can, over time. 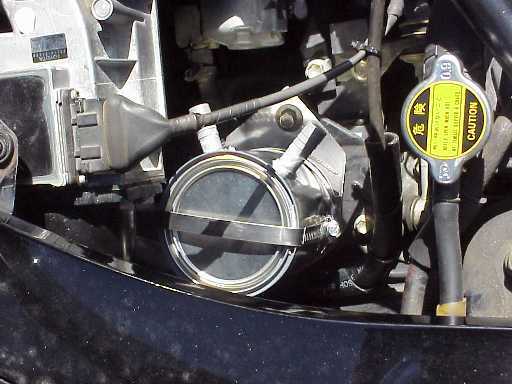 By putting the fittings in the side of the can, the hoses runs are completely horizontal, minimizing the chance of a kink. The side of the can is more flexible than the top, making it difficult to guarantee a good seal with the hose couplings, but we'll see how it goes. If I have to re-do the project, I'm out only two bucks for the can. Actually, if I have to do this over, I'll check out some propane and natural gas suppliers, and see what kinds of fittings they have available (thanks to Dice for the suggestion). 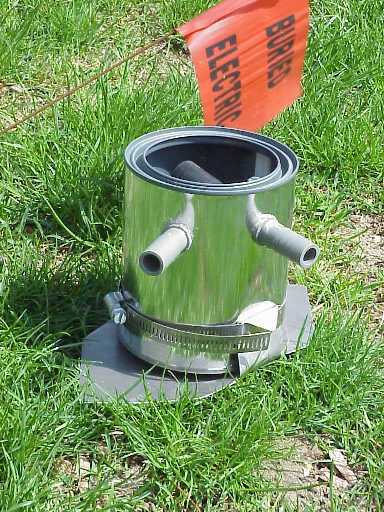 Maybe I could even get a pint-sized pressure vessel welded up for a few bucks. I made a simple bracket that bolts down to the intake mounting plate, and to which the catch-can attaches with a big hose clamp. 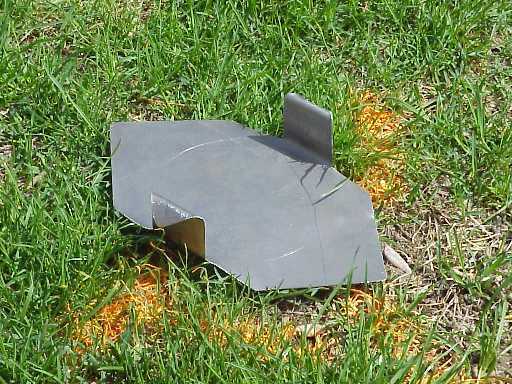 Put the catch-can in the middle of the piece of sheet steel and scribe the can's base onto the steel with the screwdriver. Put the can away again. Using the bench vise, bend up two corners of the steel 90-degrees such that the can will just fit between the two bends. The bent-up pieces of the steel will be the tabs to which the can straps. Don't forget to dull all the cut edges and corners with the rasp, to prevent cuts to hands as well as to all the rubber hoses in this area of the engine compartment. So from this point it's all bolt-on. 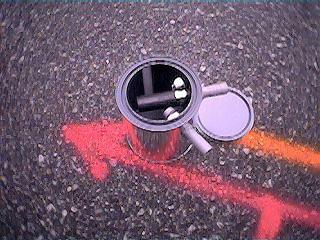 Tighten the 165mm hose clamp around the catch-can, oriented top to bottom, such that it holds the lid on. 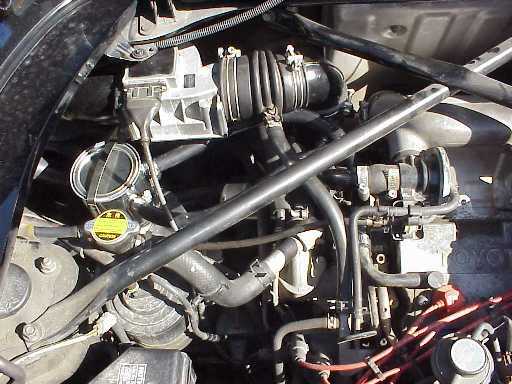 Remove the stock rubber hose that goes from the PCV pipe in the valve cover to the rubber intake pipe. Stick it in your bag of stock parts that you may never use again. 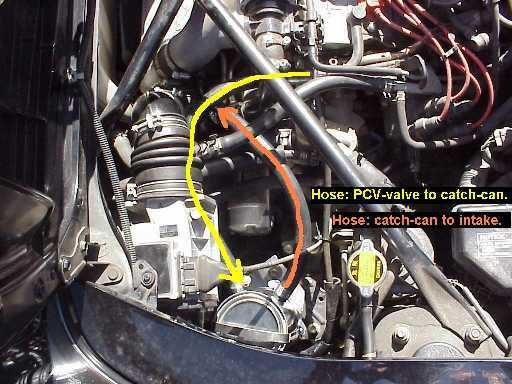 Cut a length of 5/8" heater hose to go from the PCV valve to the catch-can. Install it with new hose clamps at each end. 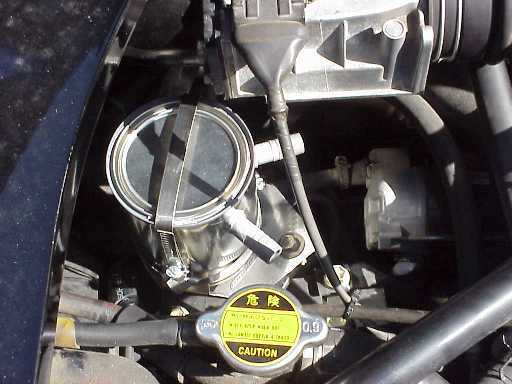 Cut a length of 5/8" heater hose to go from the catch-can to the PCV inlet on the intake pipe. Install it with new hose clamps at each end. That's it. The next step is to take apart the entire intake tract and clean it of oil. If the oil was coming from the PCV circuit, then the oil sweats should not come back. If they do come back, then at least I'll know it's not coming from the PCV circuit!